You know it’s time for college football to kick-off when Lee Corso makes his pick and dons the big mascot head at the end of ESPN’s College GameDay. If you can’t watch the show on TV, you can still catch all the previews and prediction from Lee, Kirk, Desmond, and Chris Fowler on ESPN Radio online. 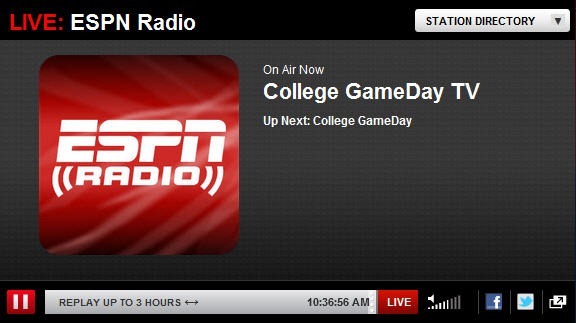 Beginning at 10:30 AM ET on Saturday, ESPN Radio simulcasts the popular college football pregame show. Sadly, we can’t always be flopped in front of the TV or computer all day Saturday. If you have yourself a busy weekend with errands like Home Depot and Bed Bath and Beyond (if there’s enough time) you can also listen via the ESPN Radio app or TuneIn Radio app. With TuneIn Radio, you’ll have to do a search or navigate to the Sports section to find the show. See the download links below.